Anyone who cares about parkrun will know that it was founded by a far-sighted man called Paul Sinton-Hewitt. I am greatly in his debt for the weekly activity, for the bonding it has given me with my sons and many friends, and for the wisdom and ideas that have flowed from running, all of which I have tried to condense into Why Running Matters. So you can imagine how thrilled I was yesterday - and how honoured I felt - when I saw a tweet below from him saying my book was 'fabulous'. In 2011, I wrote an essay entitled 'Why historians should write fiction' for Past and Future: the magazine of the Institute of Historical Research. This was to accompany a conference run by the Institute of Historical Research. It has now been translated into Portuguese by Pedro Toniazzo Terres and is available to read in that language here. This stress fracture is stopping me running at present, which is most vexing. But it doesn't prevent me from volunteering. 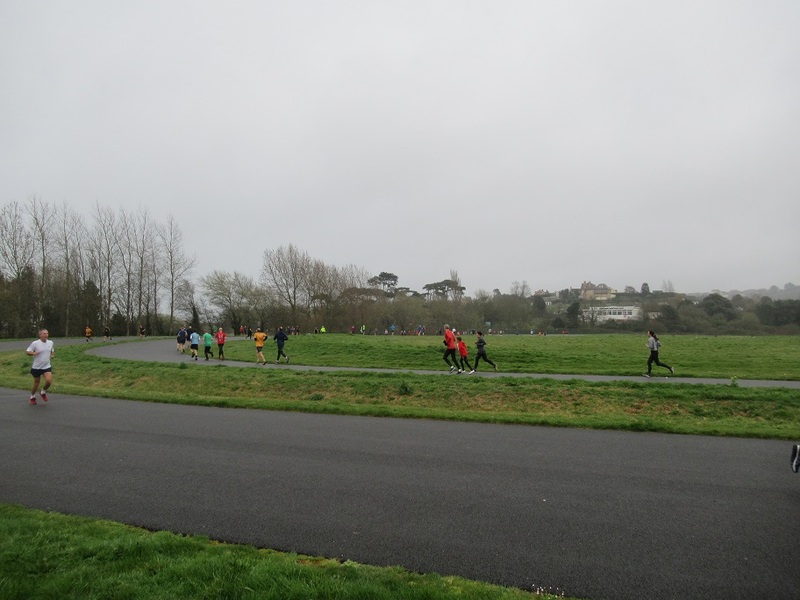 So I wrote the run report for today's run at Torbay Velopark parkrun. The version on their website is awkwardly displayed, so if you want to read it with a better layout, follow this link. Just to remind readers here in Devon, I am giving out three free, signed copies of my new book, Why Running Matters, at Exmouth parkrun on 6 April 2019. You don't have to run the 5K. Just come along and look for me (wearing a shirt with the cover on the chest). Alternatively, if you want your own copy signed, bring it along. I did the Bath Half. It wasn't easy, with a femoral diaphysis stress fracture, but I did it. Why put myself through that much pain? First, I was running with my eldest son, Alexander, and that is always a joy. Second, I hadn't run any great distance for two weeks and I was missing it, feeling my strength slip away. 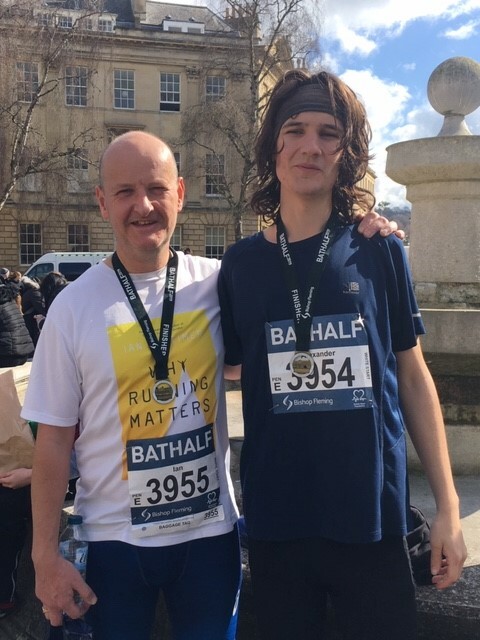 Third, I was still smarting over the way the Bath Half made me suffer in 2017, when I went off too fast and regretted it for the second half of the race (as described in Why Running Matters. But mostly it was because I had said I would. My resolution to do ten half marathons this year took priority over the fear I'd worsen the damage. 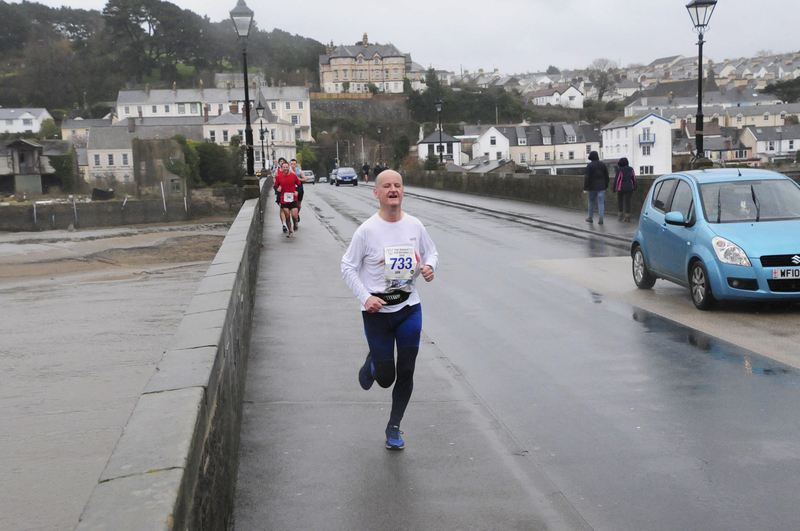 In the end, painwise, it was much like Bideford - agony for the first two miles, painful for the next five, and then a repetitive dull ache for the rest of the race. 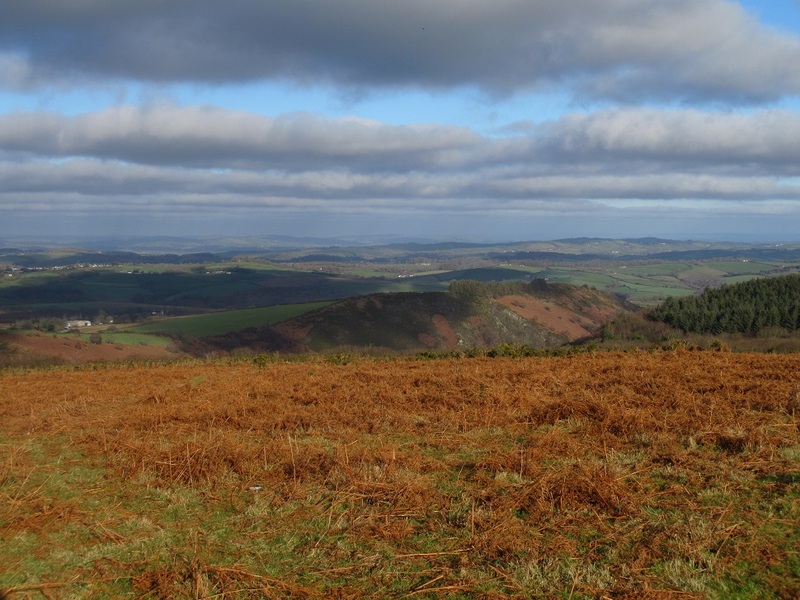 But this time, unlike Bideford, I was unfit. No hope of running fast. I ended up doing 1:44:01, seventeen seconds slower than two years ago. But it was a great occasion, a marvellous celebration of running. And Alexander did his best half marathon to date. The family came to watch me finish, and Sophie and I stayed in the basement apartment of Jane Austen's house in Sydney Place, which I found very moving. The intimate spaces of historical writers I admire (like Byron's Newstead Abbey, and Wordsworth's Dove Cottage) are wonderful - when you can be alone there. Actually to stay there was special indeed. 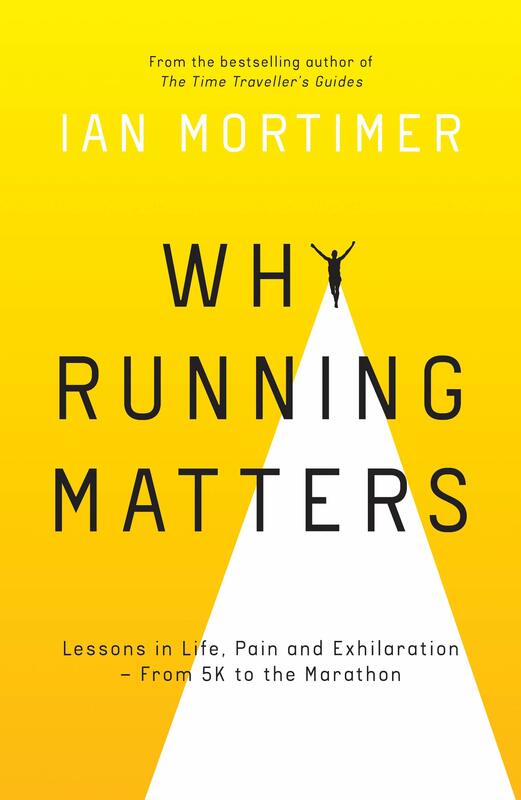 To remind local readers here in Devon, I am giving out three free, signed copies of the newly released Why Running Matters at the next two parkruns I attend. 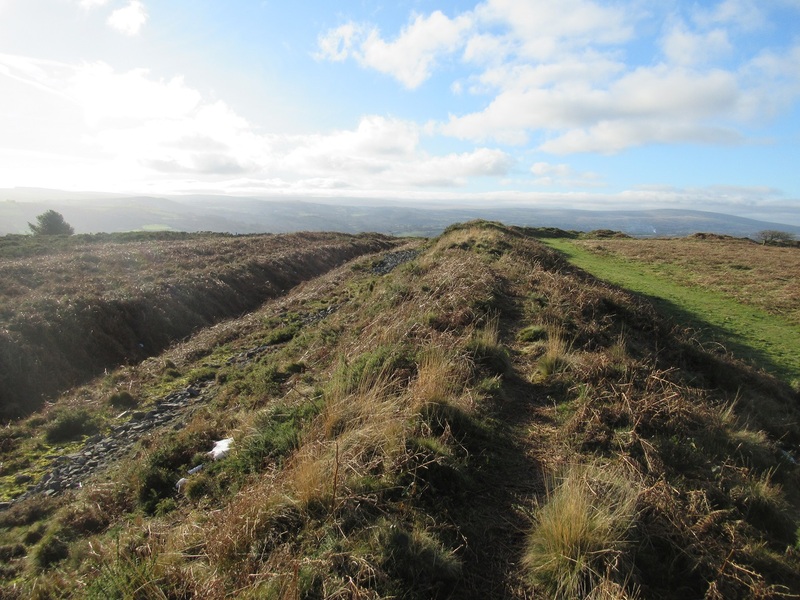 These will be Torbay Velopark on 23 March 2019, and Exmouth on 6 April 2019. You don't have to run the 5K. Just come along and look for me (wearing a shirt with the cover on the chest). Alternatively, if you want your own copy signed, bring it along. I will make sure I have a pen. Why Running Matters - Published Today! Publication day has finally arrived, in the UK at least. The ebook, paperback and audiobook of Why Running Matters: Lessons in Life, Pain and Exhilaration - from 5K to the Marathon are all published today. Hooray! It feels like it's been a long time in the making - I started this project with a run on New Year's Eve 2016. Exmouth on 6 April 2019. You don't have to run the 5K. 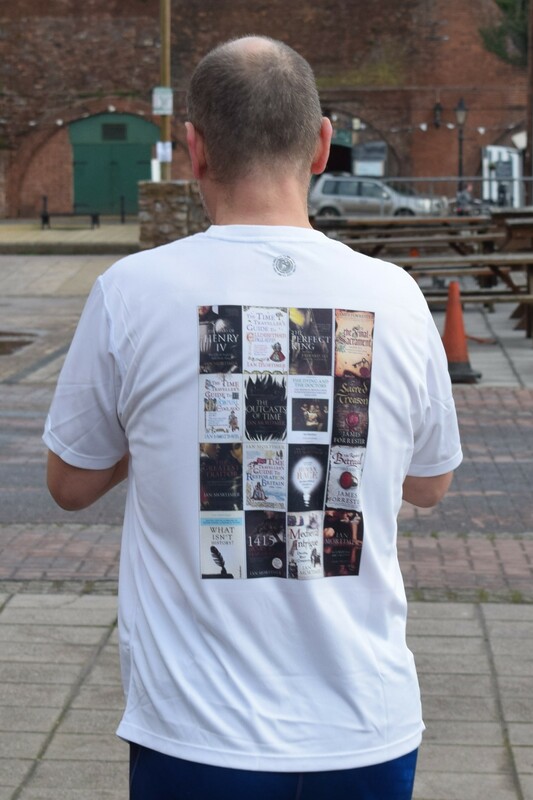 Just come along and look for me (wearing a shirt with the cover on the chest) and ask for a copy of the book - and promise me you'll write an honest review on amazon.co.uk. Alternatively, if you just want your own copy signed, bring it along to one of those events and ask. I will make sure I have a pen. 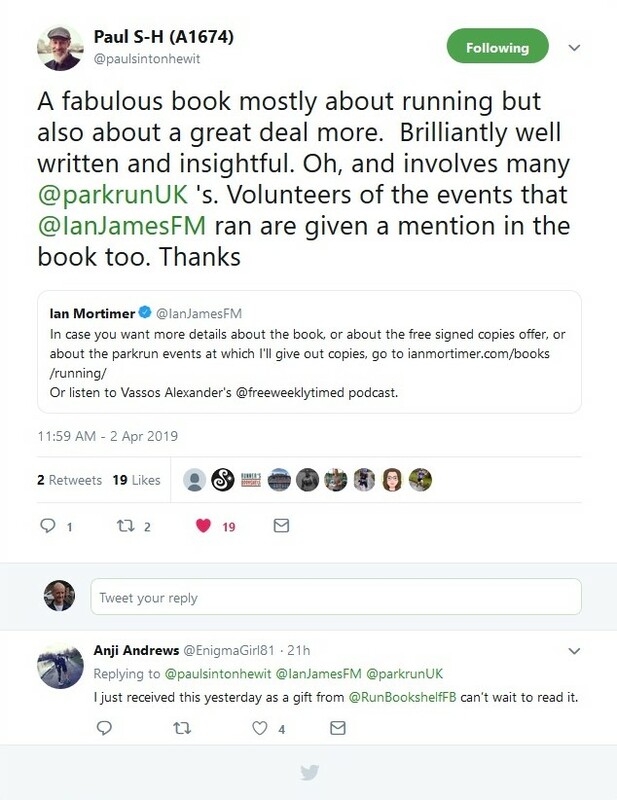 Vassos Alexander very kindly said some great things about Why Running Matters this week and had me on his podcast, Free Weekly Timed, to talk about the book. Okay, so how did Brighton leave me? Unable to walk. It was a really stupid thing to do, to run a half marathon on a suspected stress fracture, in terms of maintaining fitness. But somehow I could not stop myself. And I knew afterwards that, even though I could not walk without feeling I was bashing a bruise, I was going to run in Bideford too. I was apprehensive, but as I said to my friend Bob Small, 'I'll give myself a 20 percent chance of finishing but a 100 percent chance of starting - that's pretty much all you can do with anything in life'. So I drove the two of us to Barnstaple in the rain to do the 25th Bideford half marathon. I like the above picture. It looks like I'm doing well, ahead of all those people. Actually they're all about to overtake me. I finished 251st out of 1266. It wsn't easy. Normally running on an injury gets less painful after about 2-3 miles. This time my femur hurt for the first 7 miles and then came back with a vengeance after 10, and only subsided when the exhaustion took over at the start of the 12th mile. But at the end of the day, I did it. I could barely walk afterwards - no way could I run - but my time was another personal best: 1:38:42. Slowly we improve, little by little, inch by inch. Well, by four seconds in this case. The best bit, though, was the prize giving, and watching Bob pick up the prize for the fastest over-seventy-year-old. The organisers were most impressed with his 1:51:20, and were gracious enough to say so. No other gentleman of such distinction was under two hours. A week ago I went for a long run and came back with what I suspected was another stress fracture, in my right femur. I was not going to let the mere suspicion of an injury put me off, however. Indeed, I was going to run all the harder in the Brighton Half Marathon just in case my suspicions were well founded and I had to take some time out. So yesterday I went for a new personal best time in the Brighton sunshine. Came home in 1:38:46, after running 21.33km (Strava reckoned I did the half-marathon distance in 1:37:48). 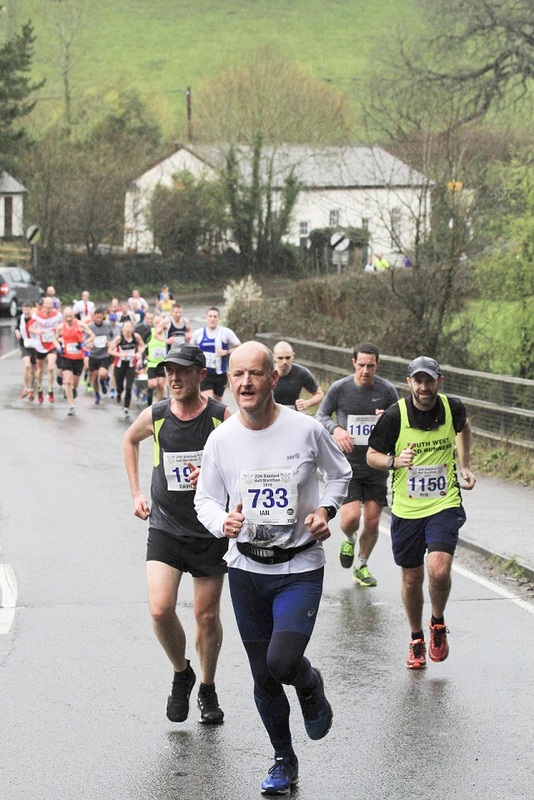 You can see the effort on my face in the closing stages in the picture below. My younger brother Robbie ran with me, albeit a little slower, and our youngest brother David declared afterwards 'Robbie looked like he was out for a walk in the park but, Ian, you looked like a bull was standing on your balls'. 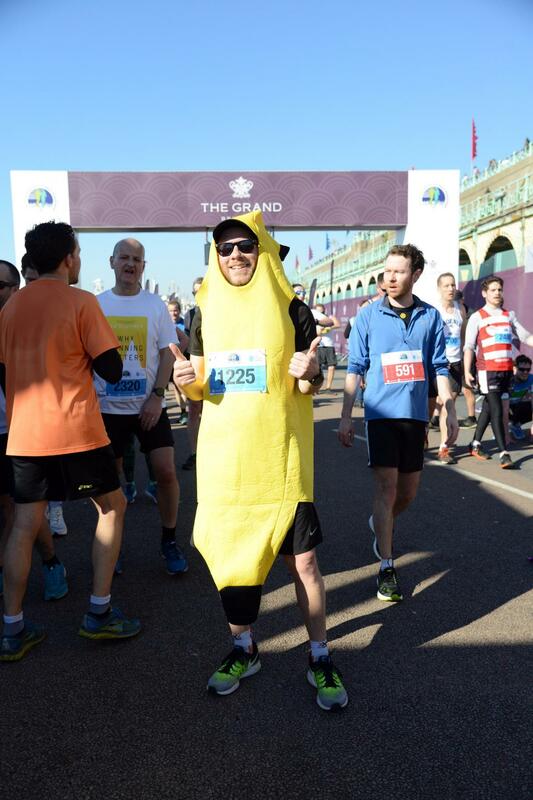 But just in case I should congratulate myself too much on a new best time, the local newspaper printed a picture that reminds me I was beaten by a man dressed as a banana. 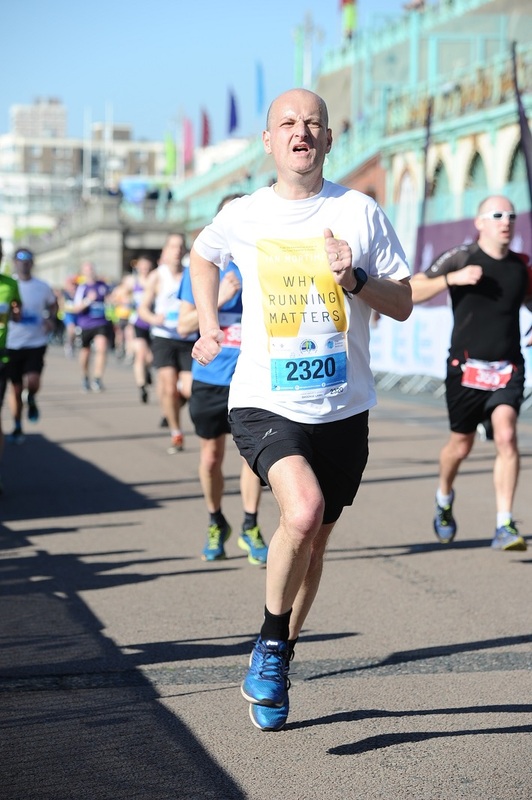 The webpages for my forthcoming book about the meaning of running, Why Running Matters: Lessons in Life, Pain and Exhilaration - from 5K to the Marathon, are now live (mostly). Are you one of the 599 parkrun helpers acknowledged in the back? You can check by the 'look inside' feature on amazon.co.uk. ...and the covers of sixteen other books of mine on the back. I've got to say, it was hard work. 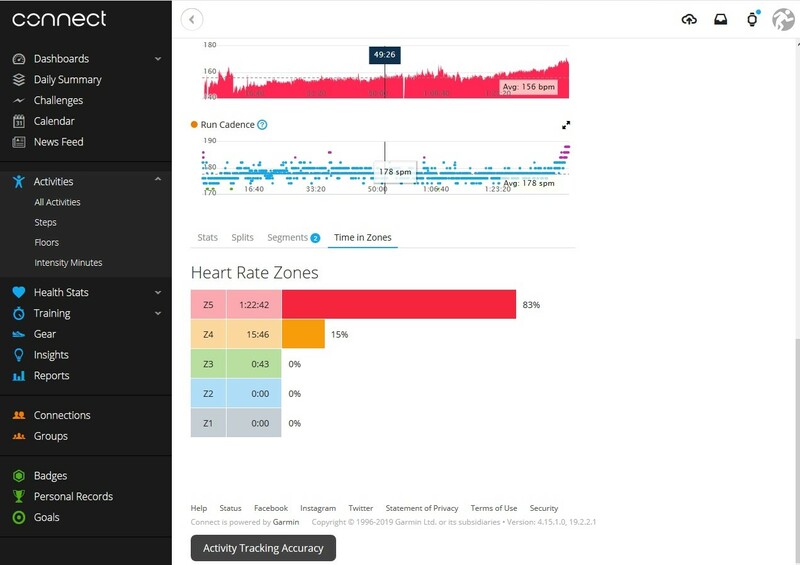 When I returned home, I checked on Garmin Connect and saw that no less than 83 percent of my race was run in zone 5 (over 90% of maximum heart rate). 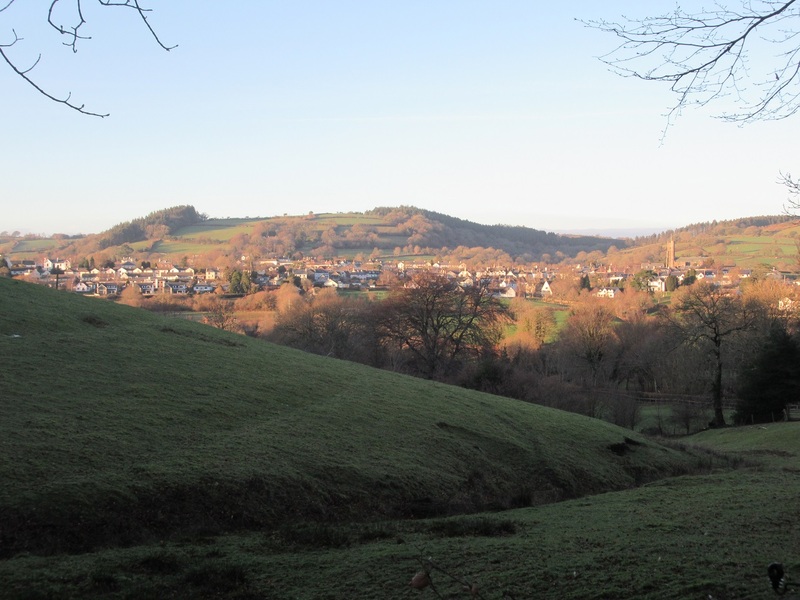 I know I should not speak too soon, especially after the late snow falls last year, but I was so pleased to find the sun out today, and to realise that the overnight rain had washed away almost all that was left of the recent snow, that I just had to go out for a good long walk. I went up to Cranbrook Castle with a camera, and took pictures of the best preserved portion of the ramparts of the Iron Age hillfort. It's now less than six weeks until the publication of Why Running Matters. 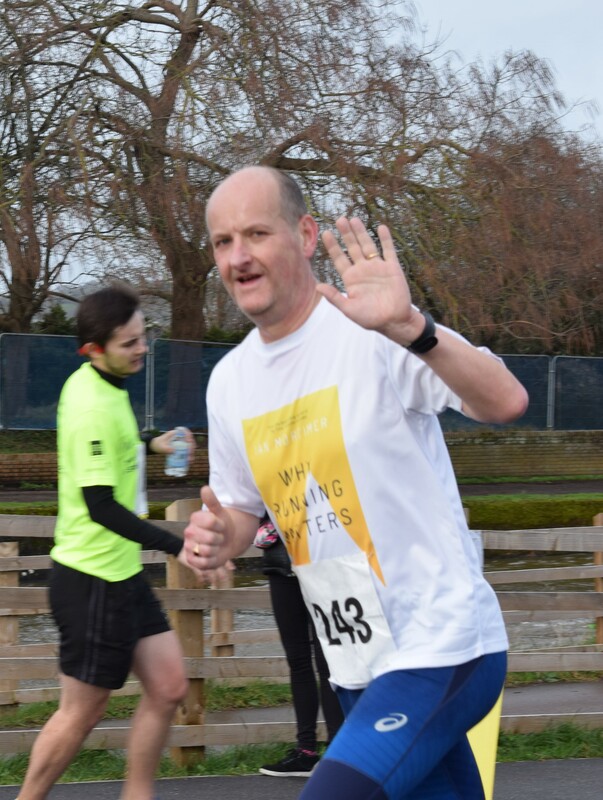 In that book I resolved to run forty-five parkruns and five half marathons in the year I turned fifty (2017) and to write about the meaning of them all. Now, I'm not intending to do that again, but it seems a bit of a shame not to set myself a new goal. So this year's running resolution is to run ten half marathons, hoping that by the end of the year I should have clocked under 100 minutes (1:40:00) for at least one of them. (My fastest to date is 1:40:25 at last year's Great West Run.) The ten I'm planning to do are: Exeter (9 February), Brighton (24 February), Bideford (3 March), Bath (17 March), Taunton (7 April), Plymouth (19 May), Torbay (23 June), Two Tunnels (Bath, 14 July), Bristol (15 September) and the Great West Run (13 October). With that in mind, I set out for my final long training run today in Exeter, along the canalside path, where there was no snow or ice, and did a fast ten miles. Very pleasingly, I managed to set a new personal best for the distance, 1:13:26. At that speed, I should be able to run a half marathon in similar circumstances in about 1:37:30. So, here's crossing fingers for next Saturday, and running Exeter's City Community half marathon in less than 100 minutes. My other New Year's Resolution is to finish the text of The Time Traveller's Guide to Regency Britain. This book is behind schedule, for a number of reasons. But chapter three is now done and chapter four underway, and I am enjoying working with the textures of the history: the contrasts of wealth and poverty, of forward thinking and resistance to change, the traditions and the innovations. Why I hope The Favourite does not win ten Oscars. As a historian, the lack of historical veracity in this film depressed me. So I felt I should explain in a note - if only to reach out to other like-minded souls. You'll find it on my Notes and Essays page. I finished recording the audiobook of Why Running Matters yesterday. It's the first book of mine that I've read completely - previously I had only done the last chapter of Centuries of Change - and I have to say I really enjoyed it. 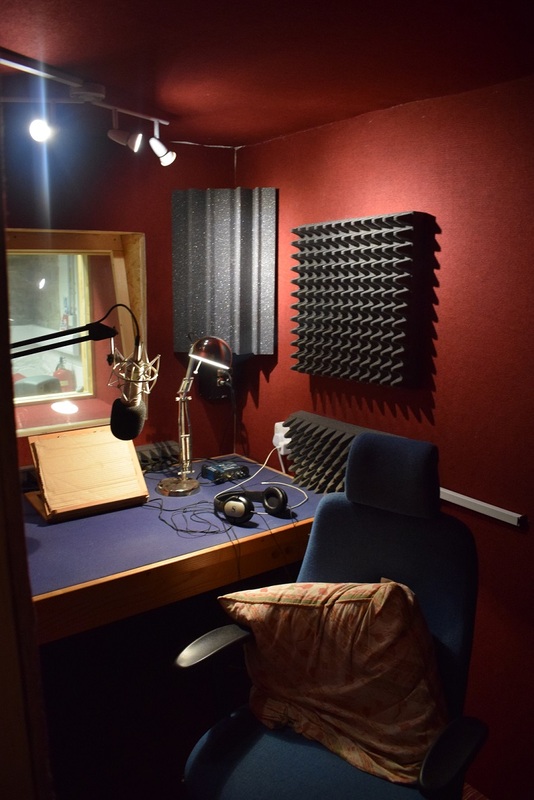 I had a brilliant, very patient producer in Lucie McNeil; and the studio, Chatterbox, is a great place, very romantically situated in the remains of an old mine, Wheal Kitty, on the cliffs above St Agnes, on the North Cornish coast; but the best thing was the actual reading. When I look at my words on the page, I see just black and white, but in reading them aloud - in giving them pace and emphasis, tone and expression - it's as if I am turning them into colour. I see that Summersdale have released the cover for my forthcoming book about running, Why Running Matters. Publication of the paperback is due for 14 March 2019. Recording the audiobook should begin shortly - but I currently have a cold, so it's been set back a bit.